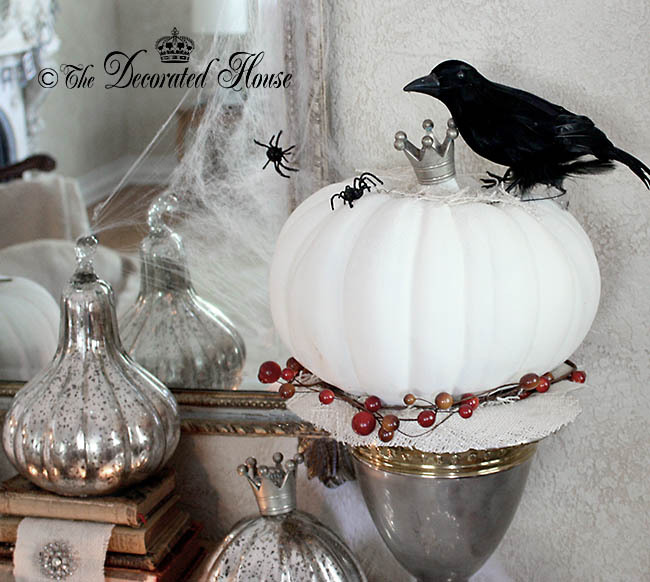 The Decorated House: ~ Annie Sloan Chalk Paint Pumpkins - Black & White with Silver Halloween Decorating! 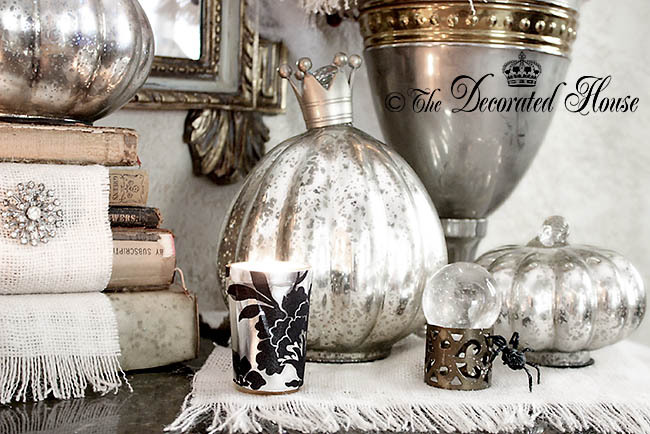 ~ Annie Sloan Chalk Paint Pumpkins - Black & White with Silver Halloween Decorating! that you probably already have! I hope you get a few ideas to use at your house. Burlap. Antique Books. Metal Accents. Vintage Brooch. Mercury Glass. and Paint it with Annie Sloan Chalk Paint. 2. Add a large Monogram on the painted Pumpkin. and to use to change the height of other elements. The three pumpkins and the cakestand are all mercury glass. 8. Unravel the ends or sides of Burlap to make a Fringed Edge. to put underneath - something else to add another decorative touch. 10. Make a Stem for your faux Pumpkin with Paper Clay. Add some fake spiders and a few webs, stir well and enjoy! Are you all done with decorating for Halloween? I totally understand that a lot of people don't care much to decorate for this holiday especially after the kids leave home and are on their own. If I had to just use the traditional colors it wouldn't be much fun for me either. But I love playing with black and white and silver and maybe a little bit of the traditional color. Outside, I still love seeing traditional orange pumpkins, although I don't use real ones anymore. 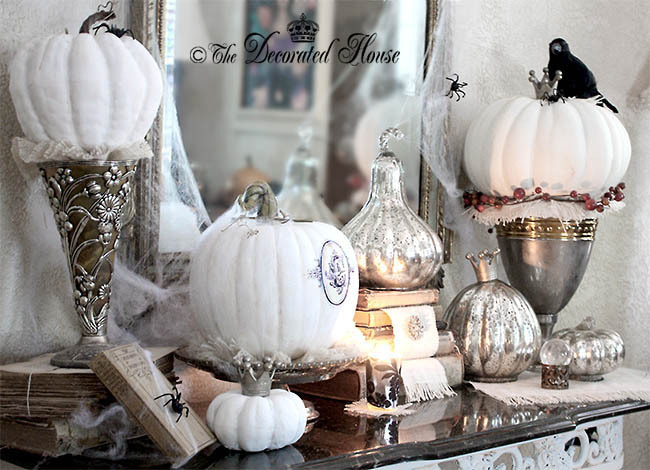 The mercury glass pumpkins are so pretty and I have really enjoyed using them each year for both Fall and Halloween. These came from Wisteria and were much less than the prices I've seen at other places. They are really very nice in person, and add just the right amount of sparkle! A little trick for you to see in the picture above is using some metallic paper in your colors, for me it was black and silver, to cover an inexpensive votive candle. It really dresses it up! Cut the paper strip the same width as the candle's height, and adhere it to the glass. If you change your mind, change the paper or use it again without anything. Each year I get asked about the monogram on the pumpkin. 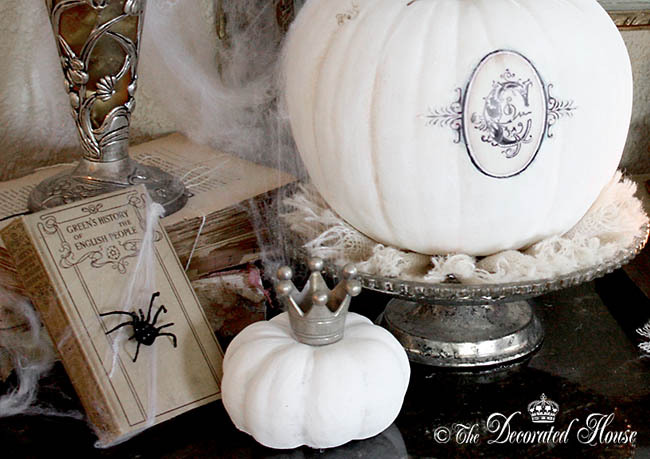 Another simple idea you could use to dress up a plain pumpkin, but it looks really great on white or black. This is a monogram that I designed a few years ago using an old letter C. I don't have the entire alphabet if there was one made, so this is not available as a digital download in my shop. Someday, I might get around to using the frame I designed and see if I can find a font that works with it. The rest of the year I try to keep any spiders out of the house! I'm not a big fan of them at all. The fact that these are black and have a touch of glitter won me over for using them for that perfect little dash of spooky. Even spider webs look fun this time of year, fake ones, of course! 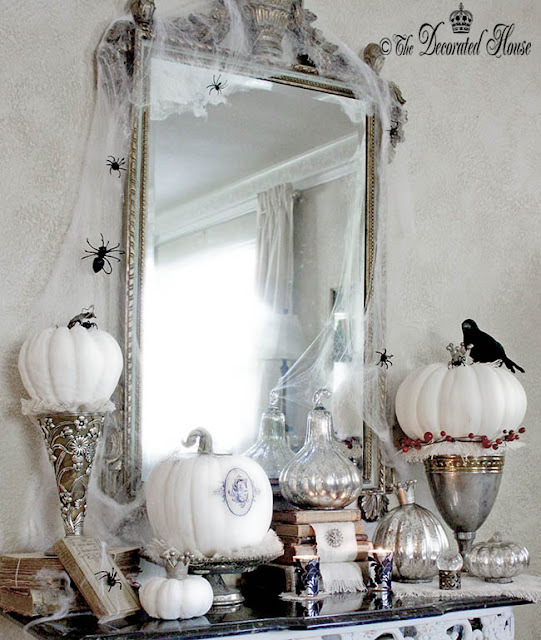 Antique books, spiders, webs, white pumpkins and burlap are the elements used here to play against silver. Most of these can be used for Fall decorating as well, minus the spiders and webs and any excess dust bunnies that seem right at home for Halloween. Pumpkins always remind us of Fall and Halloween. If you find faux ones that have the perfect shape or size that you need, you can paint them. I've posted before about how to paint the cheap foam ones with special spray paints, but I also experimented again this year with some Annie Sloan Chalk Paints. Before I used Old White, and then mixed it with some white paint to get more white with less yellow. But now they have a Pure White. I found that look I liked was to paint the pumpkins with the Old White first, then paint over it with Pure White with a heavier than usual dry brush method. This left a little darker white in the crevices. The AS Chalk Paint worked well on both my ceramic and cheaper foam pumpkins, but it took up to 3 or 4 coats sometimes to cover the awful orange of the cheap foam ones which were very bright orange to begin with. You can dress up your pumpkins in all kinds of ways. I like adding my little pewter silver crowns. Add something that fits the top that really is something that you like! Sorry, I don't have a source for the little crowns. They were purchased several years ago. Love all of your mantel. I love mercury glass. Everything looks festive and beautiful. This is one of my favorite fall vignettes! Love the vintage, elegant vignette with a dash of fun! 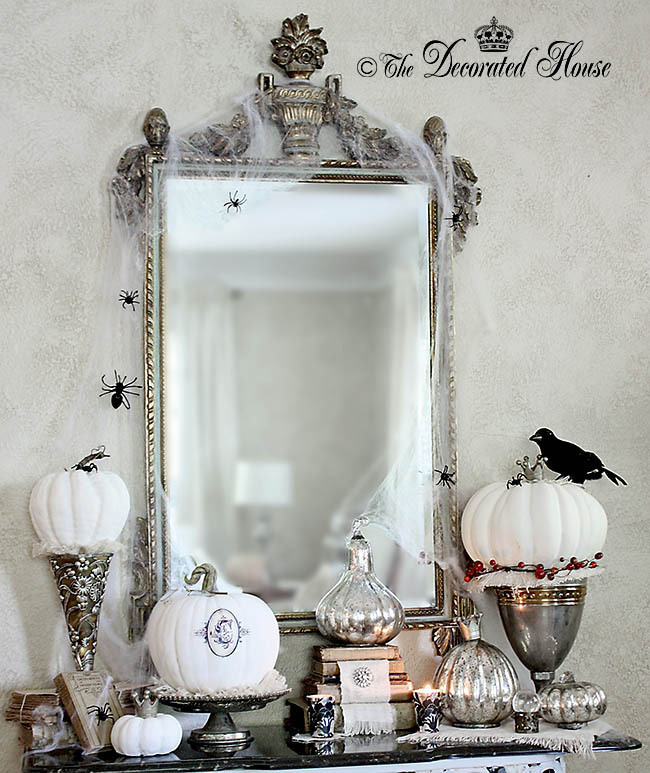 Your silver pieces are so beautiful with the white pumpkins and the metallic paper around the glass holder is a perfect idea. I will be looking for that paper. This is so pretty, Donna! If you could call Halloween decorating elegant, this would be it. 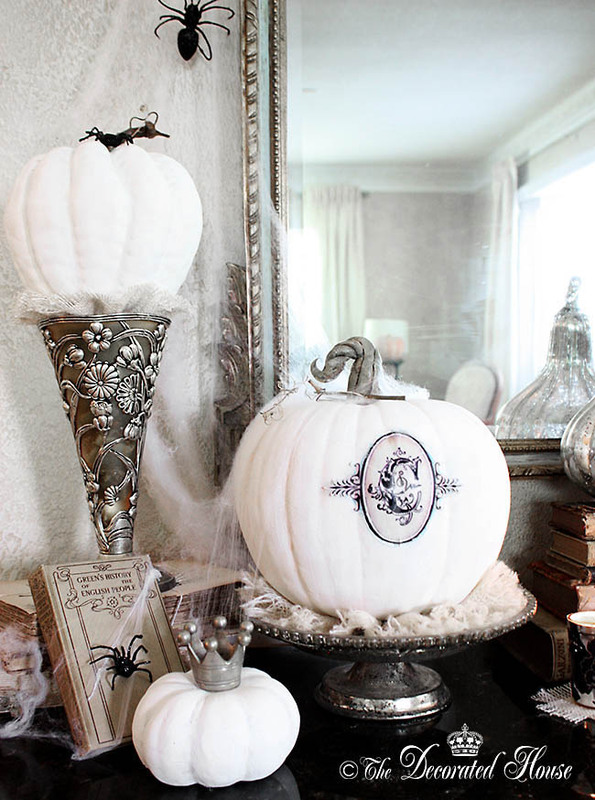 : ) I love the white pumpkins with the silver. Those little crowns are great. I find that the Pure White chalk paint needed many coats for the projects I used it on. Someone suggested to me to do the Old White first then the Pure White to make the coverage easier. Love it all. Love the idea of painting the pumpkins...you have inspired me to try something different. Thanks and your display is beautiful! Donna, this is all so pretty! 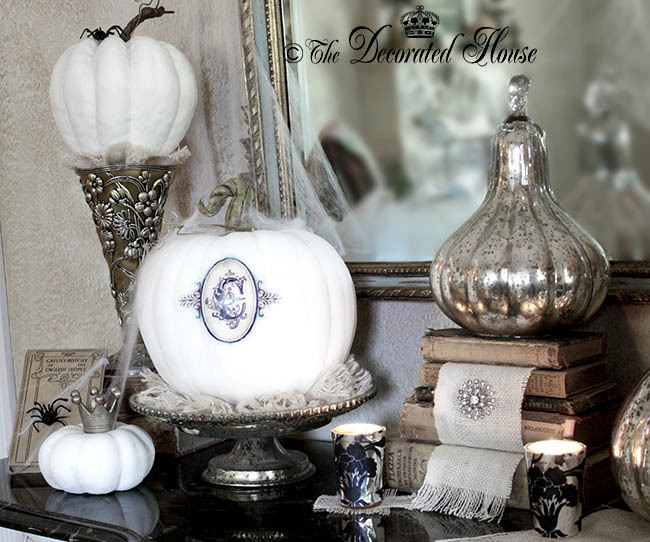 I love the shimmer and sparkle, with the white pumpkins. Your Halloween decor is the most elegant that I have ever seen. I love it! Oh I love this! Just beautiful Donna. Oh my so gorgeous!! I love the ruffled burlap under the pumpkin. How beautiful! I love the pop of color provided by the cranberry wreath and the vintage brooch-embellished burlap scarf tucked in the stack of antique books. Oh, and your paper clay pumpkin stem turned out great! Thanks so much for coming by and sharing a little Halloween fun with me here! Thank you for sharing, I also want to thank you for taking the time to stop by and leaving a comment was the best part. It's great meeting new friends and see all that they inspire. I am now going to go back and visit your older posting for more beauty.